For somebody not from New Orleans, that city sure is a part of me. From my first visit as a 17 year-old loose in the world for the first time, to my most recent visit in January 2013, I just slip so easily into place. And I can’t escape the feeling that somehow, some way, I’m where I’m supposed to be. Which is why I think I know, at least a little, how my friend and colleague Michael Mizell-Nelson must have felt about his home town. Michael died this past week from a rare form of cancer at the age of 49. It’s funny all the things you don’t know that you thought you knew. Among the thousands of things I was so sure of that have turned out to be wrong was that Michael was from an old New Orleans family. How could he not have been? If there was something to know about that city, Michael knew it. Streetcars? He was the expert. Po-boys? He was the expert on those too. Ghost stories? He knew them all. Food? Don’t even get me started. I’d known Michael via email for close to a year before I spoke to him on the phone for the first time. I came late to our Hurricane Digital Memory Bank project that Michael, Sheila Brennan, and Tom Scheinfeldt had gotten up and running right after that biblical storm season of 2005. One of the first things I learned from Tom and Sheila was how none of it could have happened without Michael. I like to think it would please him to know that I had so convinced myself that he was from one of those old, old New Orleans families. The kinds that go back forever. Instead, he and his sister were first generation New Orleans, born of parents who migrated south from Chicago. Over three decades in higher education I’ve gotten to know an awful lot of smart, talented people. But I can count on one hand the ones who fall into a category best labeled “selfless connector”: Roy Rosenzweig, Stan Katz, and Michael Mizell-Nelson. Like Roy and Stan, Michael was one of those people who seemed to live to connect people with one another. Lord knows he connected me with plenty of folks along the Gulf Coast and around the country. I try hard to be one of those connectors too. But for me it’s an effort. For Michael, it was just who he was. So many students, first at Delgado Community College, where Michael taught English, then at the University of New Orleans, where he taught history, got to see up close the Michael I had to imagine — what he was like as a teacher. I had big plans to sit in on one of his classes one day. He’d invited me to speak at UNO this fall, and at first I thought that’s when I could sneak up on him and watch him doing what he loved. But when we spoke about my trip he told me about his cancer and that he wasn’t teaching. That’s okay, I told myself. He’s going to get better and I’ll come back and sneak up on him some other time. Now I’m just going to have to imagine how his gentleness, his love of history at the street level, and his passion for his students came together in the classroom. I’m sure he was a natural. But I also know, because he told me, how hard he worked at it. 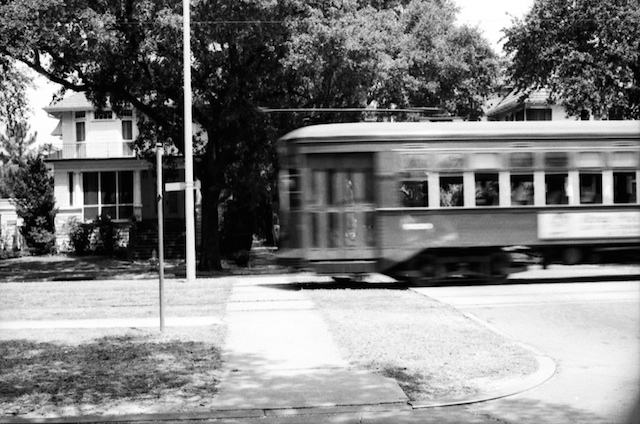 When I was helping finish up the Hurricane Digital Memory Bank I had the great good fortune to interview a very talented young photographer whose pictures of a wrecked New Orleans were some of the best I’d seen. Over the course of a couple hours in a bar she told me her tale, so much like ten thousand others from that summer. How just before Katrina crashed ashore she’d had a dream that convinced her to leave and to take her laptop with with all her pictures. How her apartment had been destroyed by the storm, and how since returning to the city she’d struggled to keep her life from falling completely apart. Michael Mizell-Nelson was the first generation in his family in New Orleans. But it was no less his place. This entry was posted in Posts on December 7, 2014 by Mills.